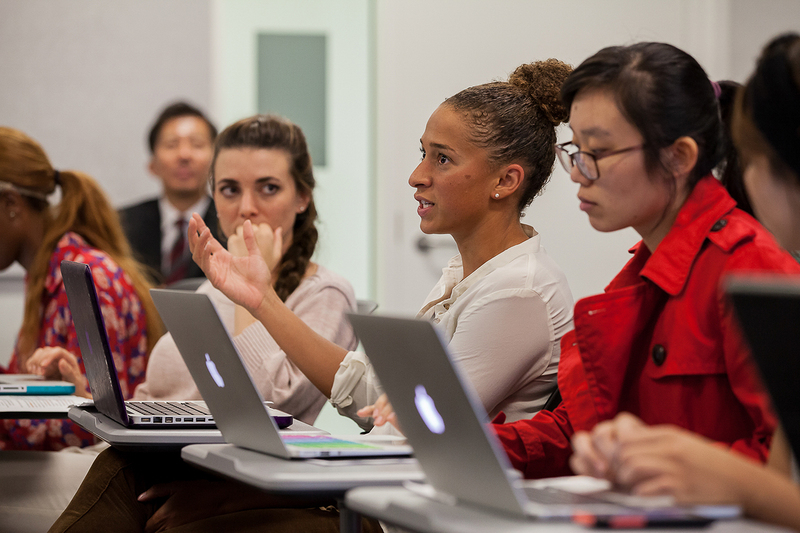 At USC Annenberg, we believe communication provides the most effective means to navigate a world of profound and constant change. We recognize that our dedication to the inclusion and equity of all populations — the true spirit of diversity — is critical to advancing the fields of communication, journalism and public relations. We also understand that the right to free speech and free press carries with it a responsibility to promote tolerance and equality, and to respect the dignity of every human being. You will see this in wide the range of scholarship our faculty pursue, such as exploring the ways in which the arts and popular culture are conduits for cross-cultural exchange or leading HIV-prevention projects that use gaming technologies to study, predict and reduce risky decision-making for diverse populations. Together with our faculty, students are running a Latinx media brand that provides bilingual content to Snapchat and using 360-video to experience South Korea’s food, seaside life and more. Each summer, we offer a four-week summer academy for local high-school students to learn about that role that media communications and journalism play in fashioning civic-minded thought leaders and innovators. As we further our commitment to diversity and inclusion, which is grounded in our history, embraced in our present and embedded in our future, this site will continue to grow. The Institute for Diversity and Empowerment at Annenberg (IDEA) frames an impressive cohort of acclaimed scholars, leading research, compelling courses, and impactful programs that allow students to examine the vast complexities of diversity, identity and culture. The Annenberg Inclusion Initiative (AII) is a leading think tank dedicated to addressing issues of inequality in entertainment in order to define areas within the industry where diversity is needed. National Association of Black Journalists, USC chapter Advisor: Lisa Pecot-Hebert, associate director, undergraduate journalism; associate professor of professional practice. National Association of Hispanic Journalists, USC chapter Advisor: Laura Castaneda, professor of professional practice, journalism. The Annenberg Youth Academy for Media and Civic Engagement is a four-week summer intensive academy for 26 talented high school students from the communities surrounding the USC. Civic Paths analyzes how participatory culture interactions encourage young people to create, discuss and organize to engage with specific civic issues and events. The Critical Media Project is designed to serve high school instructors and other educators who seek to incorporate media literacy into the classroom. The site contains a wide range of media artifacts that explore the politics of identity across issues of race and ethnicity, class, gender and sexuality. High School Day, held biannually, provides local high school students with a firsthand look at the future of communication, journalism and public relations through workshops geared toward the use of social media, mobile and other storytelling tools. Explore the sections below for student services, advocacy contacts, school-specific initiatives, financial aid opportunities for the USC student community, events, programs/training, and community outreach. Being first in the family to attend college may offer unique challenges. USC provides first-generation students with a wide range of resources and opportunities to help them succeed. The Trojan Guardian Scholars program is committed to supporting current and former foster youth who attend the University of Southern California and to build a regional network that creates new pathways for college-bound students exiting the foster care system. Through providing comprehensive support services, the Trojan Guardian Scholars program helps enable students who attend USC to experience the campus to its fullest and to achieve their goals of academic excellence, self-sufficiency, and successful professional careers in their desired fields. Contact Peggy Bustamante, Associate Dean of Diversity, Inclusion and Access, and the USC Annenberg Diversity Council.